One sunny day last month, after spending the morning at the Nashville Zoo with my sister-in-law and my adorable nephew, we all jumped in the car and headed to the airport so they could meet up with my brother-in-law and fly home. My BIL is a pilot and they fly everywhere in their own plane. Shark Boy is completely wowed by this! Here is my BIL, Shark, my nephew, and bringing up the rear, my little Bear. I have to say it seems like the way to go. No ticketing, baggage check, boarding passes, or security lines. Shark and Bear in the cockpit. What could be cooler than play-flying your uncle's real airplane? We stayed on the tarmac until we saw them take off into the bright sky, waggling their wings at us as they flew away to the east. 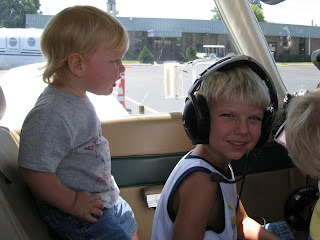 I said a little prayer in my head for their safety, even though I know that my BIL is a very experienced pilot and they were no more likely to have an incident in the sky than I was driving home on terra firma. Just a week later I heard about Stephanie, of the NieNie Dialogues blog, and her husband Christian. On Saturday, August 16, 2008, Stephanie Nielson was in a plane crash with her husband, Christian Nielson, and his flight instructor, Doug Kinnear, near St. Johns, Arizona. Doug Kinnear passed away soon after arriving at the Maricopa County Hospital. Christian & Stephanie remain in critical condition at Maricopa Burn Center. Christian has sustained burns on over 30% of his body. His wife Stephanie’s body was burned over 80%. There are a host of activities on the Internet that you can participate in to help this couple and their four children. For information, click this pretty button. One more way you can help if you are a blogger, is to submit a funny story to be reviewed for inclusion in a self-pub book that will benefit the NieNie Family. The working title: Sometimes Life Is Funny. For more information and submission guidelines, visit Sue at Navel Gazing at its Finest. If you don't have a submission, bookmark the site anyway so when the book comes out you can be first in line to buy one! All proceeds go to Stephanie and her family. It sounds like your boys had a blast! What a great idea to raise money for the family. Thanks for getting the word out! Yeah, that does sound like a blast and kudos to you for this worthy cause (how tragic) Amy.